Family friendly classic Cape with 3 bedrooms on a quiet cul-de-sac in Falmouth Heights. Located on SW Pond - hardwood floors throughout. 1 king (splits into two twins if needed), 2 additional bedrooms with full size beds. 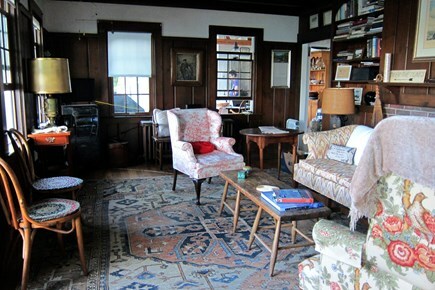 A pull-out couch in the sun room allows sleeping for 8 (additional fee > 6 people). Two baths plus a hot tub and outdoor shower. 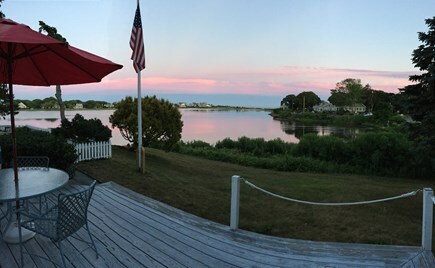 Great deck and yard for meals overlooking Little Pond (SW Bay). 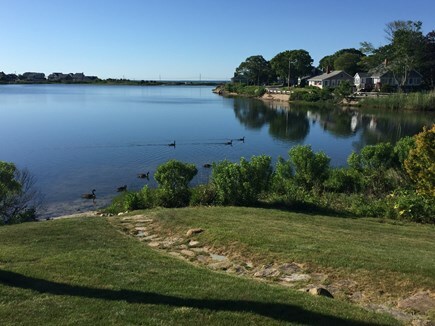 Enjoy breezes from Vineyard Sound and Little Pond. Amenities include a dishwasher, gas grill, washer and dryer, cable tv, and Internet. 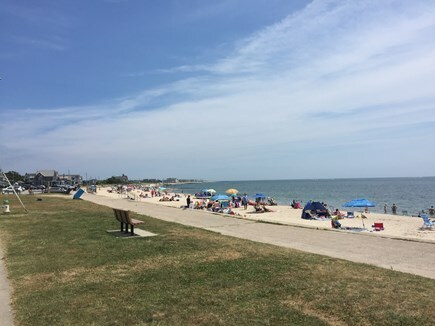 Walk to Bristol Beach and to the British Beer Company. 5 minutes to Main Street for restaurants and shopping. Feed the ducks, kayak or paddle board catch minnows on the pond. Drive to Woods Hole or catch the ferry to Martha's Vineyard or Nantucket. Less than one mile to Inner Harbor, less than two miles to downtown. Golf: Cape Cod Country Club & Falmouth Country Club are close by. Charter and Onshore Fishing, clamming with a license. Pet friendly. FALL Specials2018. READY TO BOOK SUMMER 2019 . Additional availability info: Email for additional availability. This is a Saturday to Saturday vacation rental. Additional pricing info: $225 cleaning fee, $100 pet fee. $1000 security. Discounts for 2+ wks; call re weekend/fall rates, State and local taxes of 12.45% will apply. Our family loved our stay here! 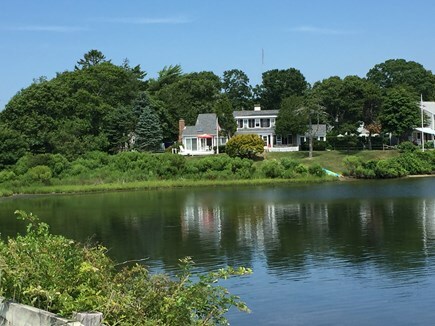 The location can't be beat....right on Little Pond, which we kayaked on every day, 2 blocks from the beach and minutes from the quaint Main street. The house itself had all the essentials and it was so nice to not have to pack linens or towels. The house had the classic cape feel and charm. We enjoyed eating on the deck and enjoying the beautiful view. We look forward to coming back next year. Thank you! It is hard to beat the location. Total serenity sitting on the back decks at any time of day looking over the pond. Easy drop in for kayaks or paddle boards. Short walk to two beaches. quick access to town or 28. Easy to accommodate 4-6 people. Our family had a great stay! Great location - walk to beach, island ferry and close to downtown. Gorgeous views of the pond and you can spend the morning watching people feed the ducks. Very happy with the house - would rent again! 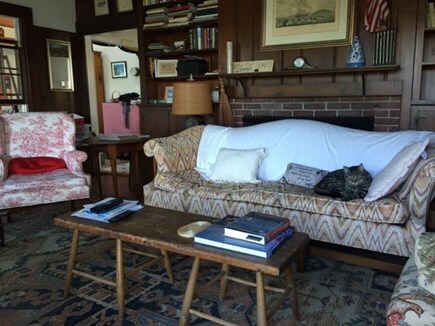 My husband and I enjoyed a wonderful three day weekend at this lovely Cape Cod home. 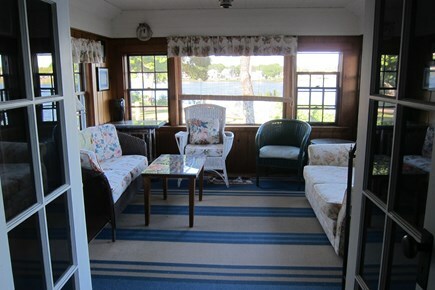 Charming, with antique furnishings, and situated in the most lovely of locations - on a salt pond just block from the ocean. We run in the mornings and each day enjoyed a lovely run along the water. We can't wait to go back!